A team of thirteen volunteers from Grant Thornton Sheffield, the accountancy and consulting firm took a day out to lend a hand to young people’s charitable organisation In2Change South Yorkshire Ltd.
In2Change is a non-profit charitable organisation that aims to prevent young people from becoming involved in criminal activities through targeted interventions designed and delivered by ex-offenders and serving prisoners. Working out of their new centre in Rutland Hall, the Grant Thornton team did their bit to help with the renovations. The volunteering day was set up by local charity South Yorkshire’s Community Foundation (SYCF). SYCF works with local businesses to help them give back to the communities they work within. Grant Thornton set up their endowment fund with SYCF so they could provide grant awards to community organisations just like In2Change. 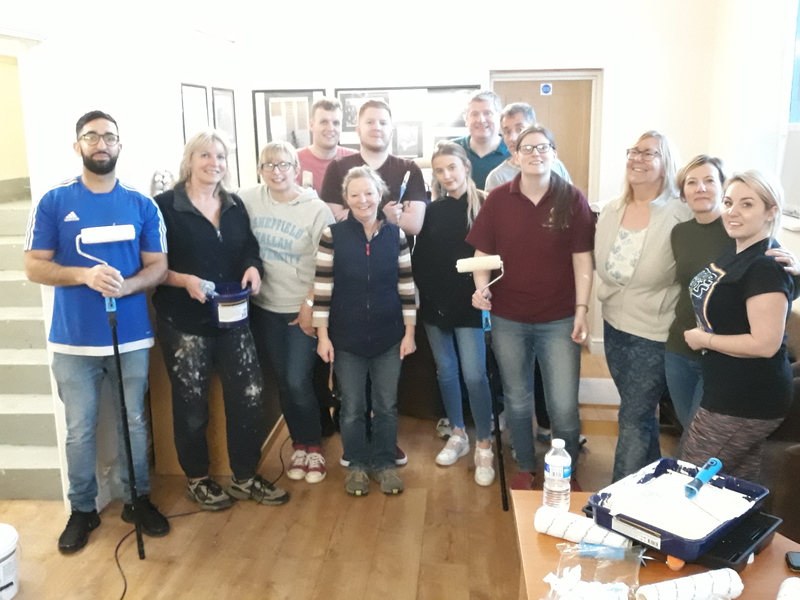 As well as holding funds with Grant Thornton, SYCF organises volunteer days for fund holders and donors to give staff the chance to give back themselves, to witness the positive impact local charities have and the difference grant funding can have in supporting their work. Armed with rollers and plenty of paint the team set to work painting the new centre staircase and landing. But before they got started the volunteers got a tour of the centre by CEO, Brian Wreakes. Which included their mock court room and prison cell, used to show young people how courts work and the living conditions of people who are sent to prison. In2Change recently moved into Rutland Hall in Neepsend, after doing extensive work clearing and securing the building so it was safe to use. Now, they are continuing their renovations and are well on their way to creating a hub of activity and opportunity for the vulnerable and excluded young people they support.